Some say that, because it’s flat, Buenos Aires is a good walker’s city. That’s debatable as, for my part at least, I’ve always preferred walking in the hills and mountains of California and other parts of the world that offer relief and, especially, more of a workout. That said, the city’s heat and humidity often make walking here more of an effort, as it did on a recent Sunday when went from our apartment to and along the riverside road that passes the landmark Club de Pescadores, Aeroparque Jorge Newbery (the city’s domestic airport), the recreational area known as Costanera Norte, and the Ciudad Universitaria, a campus of the Universidad de Buenos Aires. In the process, I saw and learned a few new things. 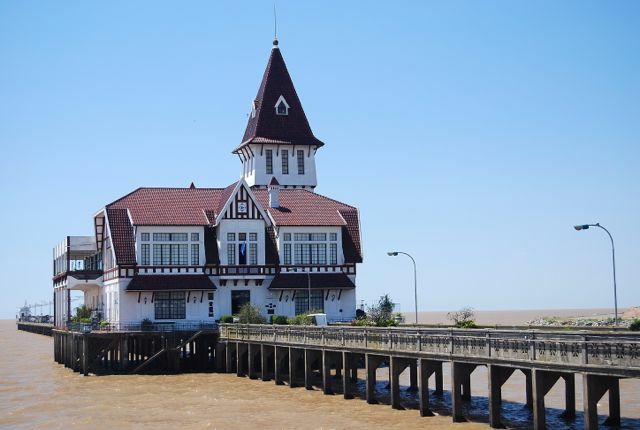 The Club de Pescadores (Fisherman’s Club) is a Tudor-style building that sits atop a pier extending into the Río de la Plata. It has a restaurant open to the public – I’ve never eaten here, though it’s an appealing site – but only club members have access to the pier. From the Club, it’s only a short walk to Aeroparque, past dozens of fishermen who cast their lines into the sediment-laden waters in hopes of snagging the night’s dinner. 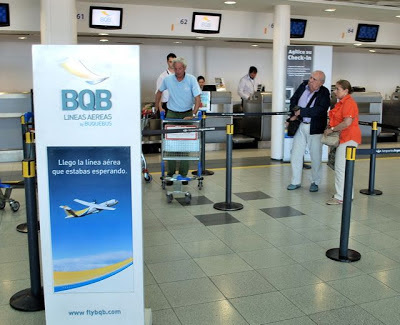 Aeroparque’s something of a mess at present, as it’s undergoing an overdue renovation that leaves little room for passengers to maneuver as they wait in line. At the small international terminal, which serves neighboring countries only, the ferry company Buquebus has finally begun flights to Montevideo as BQB Líneas Aéreas. The twice-daily services are competitively priced with the three-hour fluvial crossing, and faster in theory; given the need to arrive early at the airport, though, there’s no major time advantage. 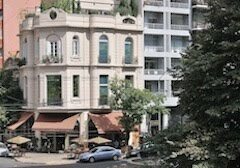 Beyond Aeroparque, the Costanera Norte devolves into a line of fast-food grills where working-class families load up on choripán sausage sandwiches; there are also several more elaborate grill restaurants. Where that ends, the Ciudad Universitaria begins, and there’s something new here since 2007: the Parque de la Memoria evokes the memory of those 30,000 individuals, many of them university students, who died at the hands of the 1976-83 military dictatorship. Recalling Washington DC’s Vietnam Memorial, the park’s terraced walls, behind a reflecting pool, acknowledge each victim individually: one of them was María Eugenia Sanllorenti, my brother-in law Carlos’s first wife and the mother of my nephew Manuel. I never met Maru, who died five years before I met Carlos’s sister María Laura, who is now my wife; still, there’s a visceral connection when I see her photograph or read her name engraved on the wall. Tired by my four-hour walk, I took the bus back to Palermo. I won’t get back to Chile until next year, but that doesn’t mean I won’t be paying attention to the stringbean country across the Andes. Last year, in partnership with Sutro Media, I published my first iPhone app Argentina Travel Adventures, which recently came out in an Android version as well. 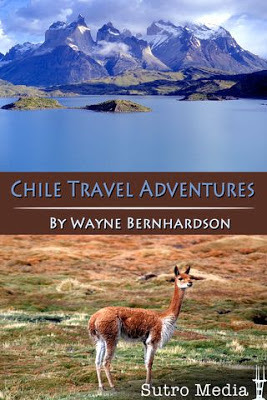 More recently – just a week or so ago, in fact – Chile Travel Adventures has gone live to complement Argentina in both iPhone and in Android format, so that readers can explore southernmost South America on their mobiles as well as in print. At just US$2.99 each, the apps are, figuratively if not literally, a giveaway, with regular updates at no additional charge. Two things I'd add - in the Club de Pescadores there's an aquarium that you can visit that features the fish of the Paraná Delta where you can learn a bit about them. And, just moments past the Ciudad Universitaria is Tierra Santa, which is a fascinating retro-religious theme park that's worth a visit, once. Duly noted, especially the aquarium. I've known about Tierra Santa for some time, but I cannot bring myself to enter, or even mention, any Disneyland for evangelicals. It's simply toxic, and I'd like to see them go away.